Absolutely the single worst film in Gene Hackman's brilliant career. It's a disaster. Dan Aykroyd, perhaps the greatest sketch comedian of his generation, never found many movie roles that could sustain his style of humor for the length of a feature film. This is not one. He's trying so hard that he even does a Roadrunner impression. But it's all a dreadful waste of good talent. wow! that sounds bad crash,i don't think i could put up with 90 minutes or more of ackroyd over acting but saying that i did like doctor detroit and he was more than just a little ott in that one! i see this 1985 drama/thriller - smooth talk starring treat williams and laura dern has just recieved a blu ray release,anyone know if it's worth checking out? https://youtu.be/vQoGRvDvSlA - smooth talk trailer. YW, I enjoyed Dr. Detroit too though I saw it again a couple of years ago for the first time in a long time, and I don't think that it has aged well. The sitcom-y elements are fairly obvious, and it's all pretty silly, but Aykroyd manages to save a lot of the material. His Dr. Detroit accent is priceless. Has anyone braved this early Adam Sandler comedy before,from 1989 - going overboard featuring the likes of Burt young,billy zane,peter berg,billy bob thorton and Adam rifkin it features on imdb's bottom 25 movies - http://www.imdb.com/list/ls052651188?ref_=tt_rls_2 - is it really that bad? Crash what about - the couch trip have you seen that as that's another one I watched when first released but now can remember next to nothing about it. YW. Going Overboard is one of the worst movies I have ever seen. The Couch Trip is better but not a classic by any means. Never Cry Wolf is kinda slow but worthwhile, intense and beautifully shot. Mean Streets is classic Scorsese / De Niro, gritty NY cinema.. very powerful movie ! Black Moon is an acquired taste, to say the least. My advice : Feel free to explore.. Thanks Johnny Roarke! I figured Mean Streets would be a yes. I'll probably watch one of them tonight. Anyone has any thoughts on this one? Damn... sorry for the huge scan. Peter delete your image then copy and paste my image to your post,it should hopefully be a more compatible size! Click the inverted commas at the top of this post which should copy everything from my post,copy just the (IMG) to (IMG) section. Then press return,next thing delete your image and then copy and paste my image in its place. By the way I have seen this movie way back when first released by Medusa home video here where i live in in the UK,can't remember a great deal from it but do vaguely remember thinking it weren't to bad! I also seem to vaguely remember watching it back in the day, but remember zero. It was reportedly prepped for theatrical release, but then demoted to DTV... which is rarely a good sign. That's what is so telling about B-movies from the 80's and 90's compared to the same from the 00's and onwards. The odds that you'll enjoy some genre trash from the 80's and 90's are roughly 75-25. After that... almost 0-100. A couple of 80s comedies that I have seen upon original release but now can remember next to nothing about,apart from the odd scene or two. Is Brian de Palma's 1986 mob comedy - wiseguys starring Danny devito,Harvey keitel and Joe piscopo. g tom selleck and the beautiful Paulina poriskova. Gonna check out Wise Guys next year because there will be Brian de Palma marathon during 2016. It's quite reasonably priced on blu ray,I've got - revenge of the ninja what I think is a total blast I was wondering if this is not far of it? It's pretty damn bad, if you ask me. And I do enjoy ROTN. ATomIK, Wise Guys, while second-tier DePalma, is very underrated. It has some hilarious stuff in it--former wrestler Captain Lou Albano is great--and DePalma never lets the pace drag. I like it a lot. 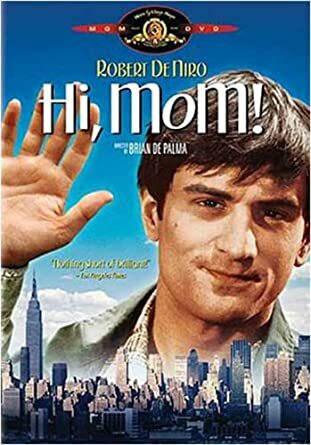 If you are going to do a DePalma marathon, and you haven't seen his early comedies like Greetings and Hi Mom, you must. I read an old review from way back when--it might have been written by Vincent Canby of the New York Times--that said one day DePalma was going to direct a great comedy. Well, we all know that he took a different career path, but he always handles humor very well even in his super serious thrillers, like all the wonderful, funny lines Dennis Franz has in Dressed to Kill. Also, having seen everything DePalma has directed, I went back and watched Get to Know Your Rabbit, his forgotten first studio film starring Tommy Smothers. I had only seen it once before, some 40 years ago, and didn't particularly like it. DePalma, the studio, and Smothers didn't get along, so DePalma got fired off of it. It was shelved for a long time. Upon rewatching it recently, I was pretty impressed. Yeah, you can tell that it was a troubled production, but some scenes are truly hilarious. And you can see DePalma already was a master craftsman early in his career. It's definitely worth a look too. Thanks for the tips Crash. I sure would watch his earlier films that you mentioned if only i could find them. I´ll keep digging but i´m afraid that i have to start with Sisters (1973) which i´ve seen once but don´t remember much. warrior, i own Rage of Honor on dvd but actually never seen it. Get to Know Your Rabbit is still up on Youtube. Greetings and Hi, Mom are going to be tough to find, but they are often available on Youtube. Dionysus in 69, DePalma's rarest film, is available to stream from the New York University film archive. In fact it's even been released here in Holland as well. Hi, Mom also occasionally turns up on the AMC channel here.